Many IT managers are curious about what is "under the hood" with our software and hosting. We believe in full transparency, so instead of vague descriptions regarding how we build and host our software, this page describes our technology stack in detail. Your website's uptime and security is as important to us as it is to you. That is why we utilize the best datacenter providers, the best cloud features, and a combination of proven technologies for running our web applications. We utilize Amazon Web Services (AWS) as the largest, best, cloud provider in the world. We use four different edge locations, including one in Canada. Our application platform runs entirely on AWS. Evo.cloud ( www.evo.cloud ) is our latest website management system. All of our applications come standard with our hosting. Many federal government agencies are now using Amazon AWS ( https://aws.amazon.com/federal/ ) because of its power, scalability, cost benefits, and improved security. The stack listed below is for evo.cloud. CSS - Built-in CSS editor. CSS3 with automatic compression. Our CMS exposes ALL design code, css, scripts, and templates with built-in versioning and editors. Code Commit - All updates to our platform are versioned. DNS - Amazon Route53 (we recommend using Amazon's redundant, distributed DNS vs. GoDaddy and other DNS providers). SMTP - Mass emails are sent using SendGrid.com's services to improve delivery success and delivery speed for newsletters. Evo311 - our new 311 system, which will rival SeeClickFix, PublicStuff, and other vendors. EvoGIS - Maps in our CMS now all store data natively as GIS data. EvoSMS - Working now, testing. DDOS Protection - Is Your Website Protected? Did you know that one of the largest municipal website design companies had a massive Distributed Denial Of Service (DDOS) attack in 2016 that brought many of their customer's websites down? When evaluating your website vendor, ASK THEM if they have had such an attack, why it happened in the first place, and what they have done to correct the vulnerability. If they mention using CloudFlare to prevent DDOS, know that CloudFlare is an additional cost. While DDOS attacks cannot be completely prevented, our systems are MUCH more resilient against these types of attacks. Ask your vendor if the websites they host share IP addresses, and how they are allocated. Traditional web servers whose DNS uses an IP for their A record in DNS are very vulnerable. With the nature of the cloud, you do not need to use a static or shared IP address for your website's server any longer. Our servers in fact use MANY IPs that change frequently, making your site much more secure. Ask the vendor if they have had a DDOS attack in the last 5 years and have them explain it in detail. Avoid spending more money for a complicated CloudFlare DNS service. Choose a more scalable, reliable cloud-based vendor that understands security. Get a copy of your host's Service Level Agreement (SLA). Insist that ANY AND ALL domain names associated with your website include 2048 bit SSL certificates at no additional charge (we provide this). 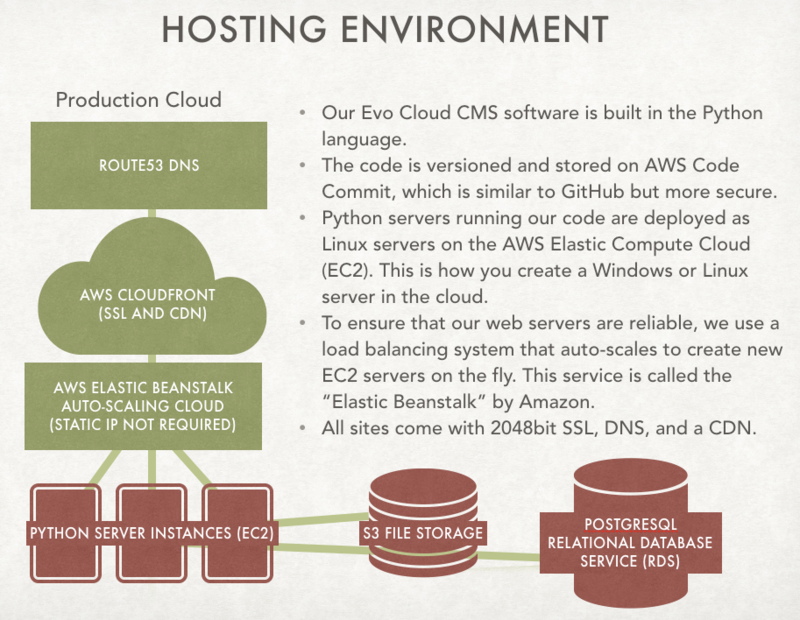 EvoGov is the only provider that makes good on all of these important aspects of your hosting.